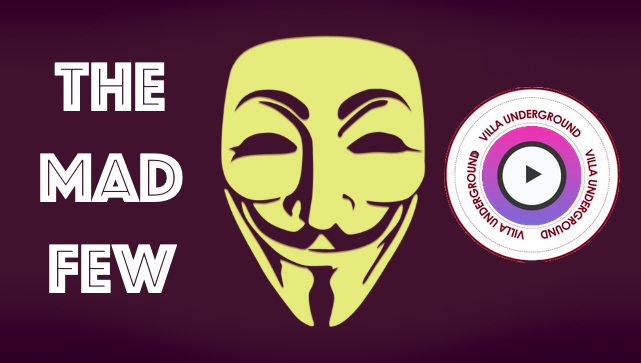 Reflection: Villa 4-2 Blues – Thrilling derby and a massive stride forward in our season. What a ninety minutes of football. Football is rammed full of cliche and hyperbole, but there can be genuinely few games, let alone derbies, that have delivered so much across the spectrum. Indeed, from the pre-match nerves with the late announcement of John McGinn’s enforced absence through injury to the remarkable Alan Hutton goal, it will be a match that lives long in the memory. Blues were decidedly quicker out of the blocks than Villa and the first half an hour provided some worry. The reasons for this will likely warrant some investigation for Smith, as we watched on as Blues cause us recurring trouble from corners. A warning sign came early, with a corner drifting dangerously across the six yard box. A real let off. We were swiftly punished though after allowing in-form Jutkiewicz the freedom of Villa Park to slot home at the far post. With Whelan playing almost as an additional centre-half (albeit making some telling contributions), it felt awfully like Villa were making old mistakes. Holding deep, inviting the opposition to attack and struggling to work the ball into areas to hurt the opposition. With Chester also looking decidedly unfit, there was certainly a growing sense of unease inside Villa Park. Moments later came arguably the moment that served to resurrect Villa. And it was Blues who perversely stoked us into life. Che Adams suffered a “Ronny Rosenthal moment” at The Holte End, hammering an effort onto the post to audible relief from three corners of the ground. Adams finding the woodwork, when the only plausible outcome was that he would break the net, changed the narrative. This isn’t, afterall, the ‘Villa of old’. The missed Adams chance seemed to galvanise us and prompted an immediate greater sense of adventure from midfield. And with it, the game turned completely on its head within two minutes. After a clever run and feint from Hutton, Adomah cut the ball back, with the ball dropping to Kodjia. Kodjia, so indifferent at times this season, made absolutely no mistake, lashing the ball beyond the flailing Camp. The celebrations had barely died down when Adomah once again terrorised from the right, reminding us that Bruce’s efforts to offload him at the end of the transfer window were flawed. The former Middlesbrough winger lifted a perfectly weighted ball to the far post that was met by a diving header by Jack Grealish. As the ball thumped the back of the net, Villa Park went absolutely wild. As the half time whistle blew, you couldn’t help but stand in a daze. Blues too were stunned and looked utterly shellshocked by both their change in fortunes and the occasion. Villa Park was suddenly a raucous, deafening arena in which they found themselves behind. Villa emerged having reportedly been dressed down by Smith for the performance in the opening 30 minutes. With his instructions ringing in their ears, this rejuvenated Villa side showed glimmers of startling promise in what [given our financial position] needs to become a promotion season. Capitalising upon a high ball into the box, Abraham, threatening all day, was brought down by a careless trailing leg. He despatched the penalty off the inside post to make it 3-1. Blues looked finished, but Villa disappointingly took their eye off the game, in which Smith would later state his annoyance about “show-boating”. With the game far from secure, some suspect defending allowed Pederson to volley a fine effort into the bottom corner beyond Nyland. That nervous tension and feeling of “here we go again” returned. Alan Hutton seemingly had other plans. On the 76th minute he picked up a loose ball; easily 10 yards inside the Villa half. Embarking upon a quickening, purposeful run forward, nobody envisaged what was to come. Holding off challenges, the former Scottish international deftly cut inside, thus taking the ball onto his left foot. Now on the edge of the Blues box, Hutton opened up his body, before curling an outrageous finish into the bottom left corner. What a way to win any game of football, let alone a local derby. He’ll never have to buy an Irn-Bru in these parts again, that’s for sure. Whilst certain to go down as a memorable derby goal in anecdotes for years to come, it also likely caps a career for one of Villa’s most ‘Marmite’ players. Hutton, an outcast for over two years under Lambert, never once moaned. Despite fierce criticism of some of his performances (including from this blog on numerous occasions) has always been both professional and engaging with supporters. 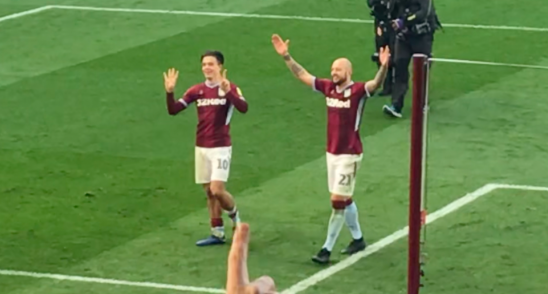 Further, despite some obvious shortcomings, Hutton can never be accused of not giving his absolute all to Aston Villa when on the pitch. Tenacious, determined and loyal to boot. Admirable qualities to define a man. He is deserving of his moment and a superb goal to be measured and remembered against. This victory must inevitably be viewed outside of the prism of the derby. The dawning reality, drowned out by the build up to the clash, was that results meant that we needed to win to keep pace with pack chasing the playoffs. Indeed, had we failed to beat Blues, an unenviable 7 point gap would’ve opened up. The mood now feels similar to that following the Wolves victory (2018), in that surely must be used as the springboard for our season. What we cannot do is follow-up with abject failures as we did under Bruce, who defeating the runaway leaders, delivered season defining tactical calamities against QPR & Bolton. It’s too easy to say we were one game away from promotion via the playoffs, when really we should’ve done the job automatically, if only as runners up. The fact remains that Smith’s predecessor also squandered chances against teams languishing towards the foot of the table in the early part of this season. Thus, we now must face up to a run of testing fixtures starting against Forest (7th) this Wednesday at Villa Park. Defeating Forest would draw us level on points with the two time European Champions and put us within striking distance of the playoffs. Saturday then see’s us travel to Middlesbrough (2nd) for the late kick off. Win both of these games and the fun really does begin. 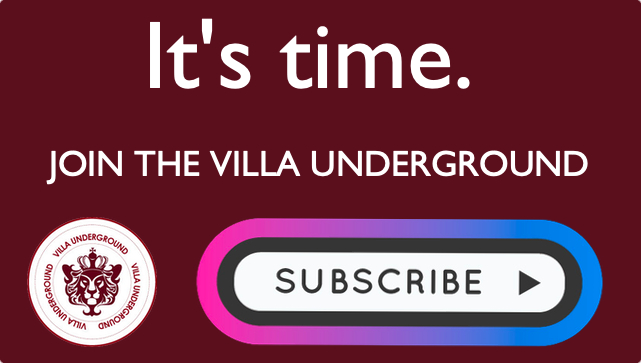 Please consider subscribing today to support independent Villa news and content across multiple channels. 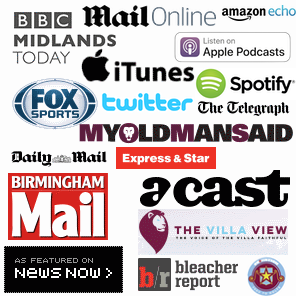 Villa Player Ratings vs Blues – See them here & have your say. Relive the scenes from the derby here.